Chicago artist Nick Cave creates costume/sculptures that he calls Soundsuits consisting of brightly colored fabrics, elaborate embroidery, beadwork, raffia and natural materials. Phyllis Galembo’s photographic portraits feature masqueraders from the West African countries of Benin, Nigeria and Burkina Faso. Call and Response: Africa to America / The Art of Nick Cave and Phyllis Galembo pairs the work of these two uniquely American artists, each of whom explores the contours of West African masquerade through their art. This exhibition highlights the role of ritual traditions within the formation of cultural identity. 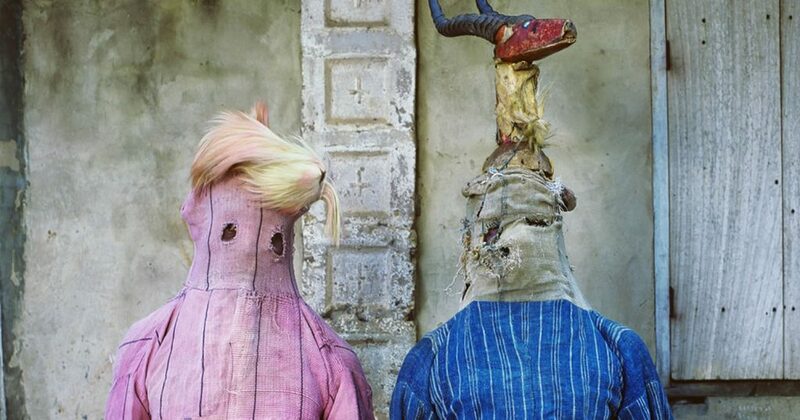 While Galembo’s intriguing photographs document actual masquerade performers in elaborate “costume,” Nick Cave’s Soundsuits offer a poetic response incorporating a cornucopia of natural and cultural elements rich in associative possibilities. The combination of these two artist’s work offers a powerful celebration of creativity, imagination, and cross-cultural communication. Call and Response: Africa to America seeks to draw both the obvious and subtle parallels between the works of Galembo and Cave.